Compressed air breathing apparatus (CABA), when stored underground may become contaminated with pathogenic mould fungus. This can produce toxins that can contribute to lung disease and contain potential carcinogens. 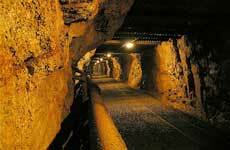 In a recent incident a component of CABA, which was stored underground in a coal mine was found to contain mould fungus. The introduction of the Coal Mines (Underground) Regulation 1999 required sufficient escape equipment to be provided to allow a safe way out from the mine through conditions of reduced visibility or possible irrespirable or irritant atmosphere. As a result, many mines introduced . . .
1. Examine all CABA and ancillary equipment including fill stations at mines to ensure they are free from fungal contamination. 2. Remove and isolate any affected apparatus from . . .